THE PRESIDENT of the European Central Bank, Mario Draghi, has said the ECB will not use its programme of buying bonds to make it easier for Ireland to break free from its EU-IMF bailout later this year. Speaking after a meeting of ECB governors in Frankfurt, Draghi said the ‘Outright Monetary Transactions’ (OMT) programme announced last August would not be deployed simply to lower Ireland’s borrowing costs when it tries to begin borrowing money independent of the Troika this year. “OMT cannot be used to enhance the return to the market,” the Italian said. “But in principle, there are rules that are there. Countries that comply with these rules are eligible,” he added. The OMT programme outlines circumstances where a country which applies to be covered by the programme can have the ECB intervene in the second-hand bond markets, increasing demand for short-term bonds so that the overall interest rate charged by lenders can be brought down. However, countries who wish to be covered by the scheme have to submit themselves to implementing certain economic measures – making the programme tantamount to a bailout-style programme. The cost of borrowing for Ireland and other peripheral European economies fell in August when the scheme was first announced, as investors welcomed the moves by the ECB to flex its muscles and assist Eurozone countries in raising money. Draghi meanwhile again repeated his praise for the Irish government in how it had stuck to the plans laid down by the ECB, along with the European Commission and the IMF, as part of the bailout programme. He added, however, that “further action” was needed by Ireland to continue reforming its financial sector and warned against the possibility that Dublin could become “complacent” about the reforms it still needed to implement. The monthly meeting of the bank’s Governing Council decided not to adjust its main interest rate, leaving it at 0.75 per cent for another month. 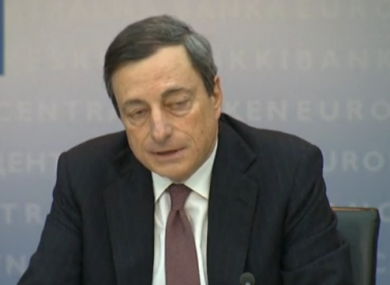 Email “Draghi: ECB's bond-buying programme can't help Ireland escape bailout”. Feedback on “Draghi: ECB's bond-buying programme can't help Ireland escape bailout”.